One of the things I enjoy about sous vide is how easy and convenient it is to cook. Especially if you have several spices or spice mixtures on hand you can just toss the meat into the water bath and figure out how you want to season it later. That's what I did here with sous vide pork chops. In this case I had some nice, thick pork chops in the fridge so I decided to do them sous vide. I tossed them in the water bath just after lunch at 140°F (60°C) and took them out when dinner was getting close, about 6 hours later. I patted them dry and then added a sweet spice mixture for pork I had laying around. You could also use any spice mixture you enjoy, I'm sure a vindaloo, Jamaican jerk, or Italian herb seasoning would be good as well. I threw the sous vide pork chops on a hot grill and gave them a nice sear. For a side I just used roasted root vegetables. I cubed some carrots, potatoes, onion, garlic, and winter squash then tossed them with olive oil and salt and pepper. Then about 30 minutes before I wanted to eat I put them into the oven at 350°F (176.7°C) and took them out when they were nice and soft. They went great with the sous vide pork chops and the whole thing only took 15 to 20 minutes of prep time from start to finish. 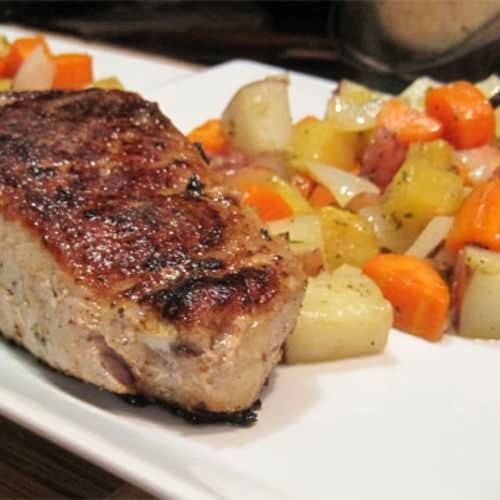 If you would like more information about the modernist techniques, ingredients, and equipment used in the Simple Sous Vide Pork Chops you can check out the following. Preheat the water bath to 140°F (60°C). Salt and pepper the pork chops, add to the sous vide pouches and then seal and place in the water bath. 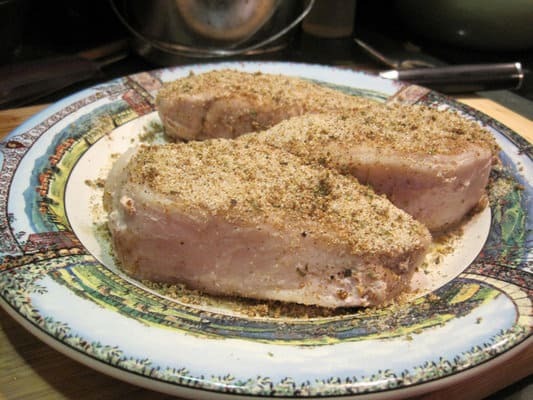 Cook the pork chops for 3 to 6 hours. Preheat an oven to 350°F. Preheat a grill to high heat. About 30 minutes before eating, toss the vegetables with the olive oil, garlic, and salt and pepper. Place on a roasting tray with raised sides and add to the oven. Remove when the vegetables are soft, 20 to 30 minutes. Take the sous vide pork chops out of the pouches and pat dry. Liberally sprinkle with the spice mixture and let sit for a few minutes. Sear them on a very hot grill for 1 to 2 minutes per side. Remove from the heat and serve. One of the things I enjoy about sous vide is how easy and convenient it is to cook. 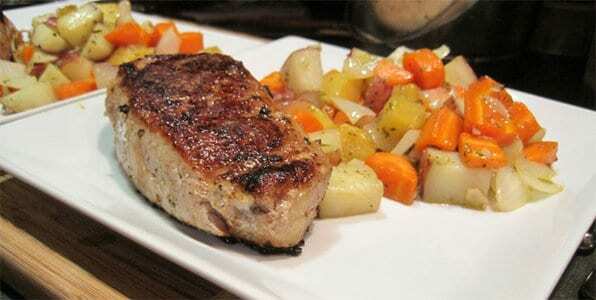 That's what I did with this simple sous vide pork chop recipe.